Christopher Cokinos. Warner Books, New York, 2000. The title of this remarkable book refers to a short poem by Emily Dickinson, written in 1861: Hope is the thing with feathers that perches in the soul and sings the tune without the words and never stops at all. The author Cokinos is a poet, an assistant professor of English at Kansas State University. He is also an avid bird watcher, past president of the Kansas Audubon Council. 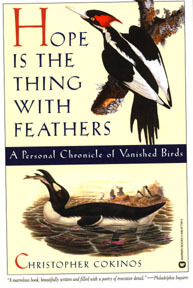 For ten years, Cokinos followed a very personal dream, an odyssey of discovery in which he traced the events leading to extinction of six species of birds in recent times: the Carolina parakeet, the ivory-billed woodpecker, the heath hen, the passenger pigeon, the Labrador duck, and the great auk. With great emotional impact he cronicles the last days of these vanished birds, and the heroic but ultimately futile efforts of a handful of bird-lovers to save them. Cokinos places great value on remembering, for our memories are all we will ever have of these birds now. Part poetry, part storytelling, part diligent research, part personal memoir, Cokinoss account has a powerful emotional impact, Cokinoss book is not just for birders. His real story is about how our lives are intertwined with the lives of these lost creatures, and how much we have lost in loosing them. A sad, passionate, and yet hopeful book.